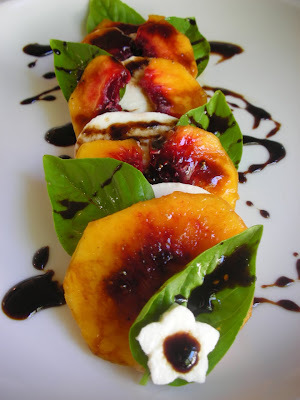 The Italian Caprese Salad takes on a California Fall twist with the peak of the season's PEACHES and a Balsamic/Almond Reduction Drizzle. Confession: I ate the first plate of these all by myself. It was supposed to be a taste, but oh those peaches were just so full and the basil balanced the sweet so well. I made my LET'S LUNCH FALL SALAD a few days ago, because I knew I'd be so busy this week. I have a girl-friend visiting me. Not just any friend, but a friend that I haven't seen in over 20 years. We were baton twirling Majorettes together in High School - yep, you guessed it, I'm from the Southern United States. My friend, Teresa, and I lost contact and then one day found each other on Face Book (where else). Instead of the usual, "oh sure, I'll accept the friend, I think I remember her" - we actually continued emailing and discovering we had more in common now than ever and it turned into a visit that has been full of laughs, memories, creating new memories and forming a wonderful bond that I look forward to having forever. I didn't want to miss posting this Let's Lunch Fall Salad event as I have so enjoyed meeting new food-friends like TIGER IN THE KITCHEN, BONVIVANT, COWGIRL CHEF, NAPTIME CHEF, etc. 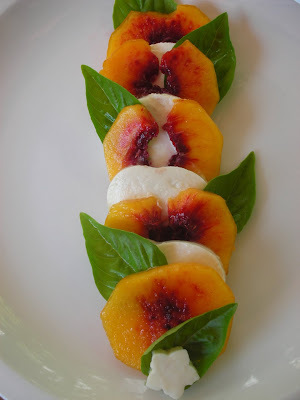 The Peach Caprese is a simple and colorful salad, and I hope you'll give it a try or be inspired by the taste combinations. 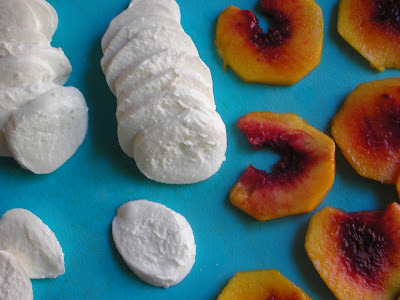 PEACH CAPRESE: uses equal slices of Buffalo Mozzarella fresh cheese and Peach. Overlap those and add fresh basil leaves along the way. The Balsamic/Almond Reduction is made with 1/2 cup Balsamic Vinegar, 3 Tbls. sugar in a saucepan, cooking on Med/High and reduced by at least 1/3 til it coats the back of your spoon. Then, add 1TBLs of almond extract and continue to stir to mix. Drizzle over the composed salad. Can be chilled or served room temp. So, forgive the short post, while I reconnect with a wonderful friend that reminds me that life can be a healing and magical circle. GORGEOUS salad!!! Thanks for the recipe...and the very sweet story. Hope you're having a wonderful time catching up. Love your salad - I've never used peaches in that way before, so thanks for the inspiration! yes--very inspiring. i would never had put that combination together. thanks for that. and just gorgeous photos, too! Hi Cathy, lovely to meet through food blogging. I am amaze after reading "about you", you are absolutely very busy woman for sure. Love the your version of caprese salad. Love the presentation, it's really pleasant to the eye. Beautiful Salad! 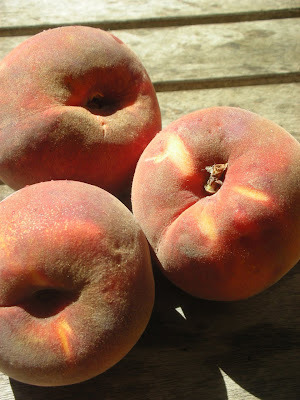 Wish I had seen this a few weeks ago when the peaches were still good in the Farmer's Market. Last week they were so sad :( I bookmarked this for next summer. Thanks for the inspiration Cathy! PHO is "Fuh?" - Daring Cooks October PHO-N!